Pork tapa is a variation of the popular beef tapa. Actually any meat could be made into tapa and there are some who make tapa out of horses, carabaos or other exotic meats. Compared to beef tapa, pork tapa is of course a cheaper alternative and is similar in taste and texture compared to chicken meat. One advantage of making your own tapa compared to buying it as frozen and ready to cook (of course you have to thaw it first), is, there are no preservatives and is cheaper because you made it yourself. Also you will notice that this tapa is sweet because the marinade contains sugar and Sprite. You can omit them if you don’t like a sweet version of tapa. Sprite is used to tenderize the meat and also adds savor when cooked but since the marinade has calamansi juice which does the same purpose of tenderizing the meat so you can omit it. Pork tapa is a variation of the popular beef tapa. Actually any meat could be made into tapa and there are some who make tapa out of horses, carabaos or other exotic meats. If the pork is bought from the wet market, wash it in running water and drain for a few minutes. Slice the pork thinly, just like when you are slicing the meat when you are making beef tapa. Set aside. In a large bowl or any plastic container (just enough to put all the meat and the rest of the ingredients), put the pork, garlic, soy sauce, calamansi juice, sugar, sprite or 7-up, salt and pepper. Mix all the ingredients until the sugar is dissolved and the meat is coated with the marinade mixture. Marinate the meat in the fridge overnight. For best result, you can use a zip lock bag, put the meat and marinade and seal the bag instead of just using a bowl. This way the meat will be marinated evenly. To cook the pork tapa, heat about ¼ cup of cooking oil and fry the meat on low heat for 8 minutes or until the pork is tender and light brown. Serve with fried rice, atchara and fried egg for a hearty breakfast or lunch. 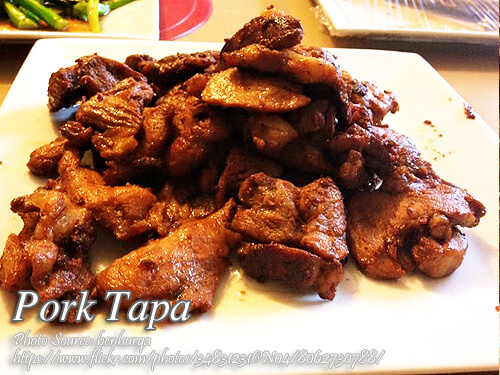 Thanks for this pork tapa recipe! I love the slightly sweet taste of this tapa! Hi Cherry, you are welcome! What do you do with the leftover marinade? Do you cook the pork in the marinade to make a sauce or drain the pork and discard the marinade? Hi Phil, just discard the marinade.